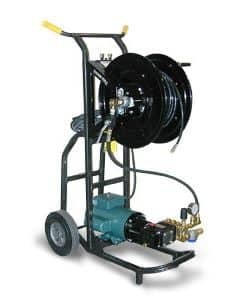 This unit, like other cart mounted sewer jetters, can be used to clean laterals back to a house or other lines up to 6” in diameter. Other applications include cleaning suction hose or even can be used to wash trucks and other equipment. This unit packs a punch of an 11 hp cart model in a convenient 48” aluminum diamond plate toolbox that you can mount anywhere. 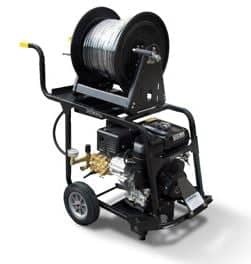 This unit can be used to clean laterals back to a house or other lines up to 6” in diameter. Other applications include cleaning suction hose or even can be used to wash trucks and other equipment. This unit can be used to clean laterals back to a house or other lines up to 6” in diameter. Other applications include cleaning suction hose or even can be used to wash trucks and other equipment. 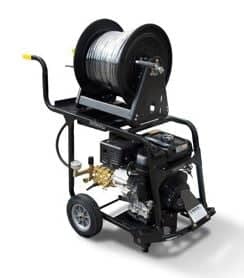 This unit is perfect for pumper/cleaners dedicated to small residential applications with up to 4” diameter lines. This durable powder-coated cart is both an economical and portable electric powered unit. This unit’s front bumper bar protects the pump and motor. This user friendly model is geared for both residential and commercial sewer lines up to 6” in diameter. The optional lateral cleaning kit package allows you to leave the engine outside a building while you clean lines inside. With an automatic throttle control valve, the engine responds to your water usage. Open the flow and it revs up to maintain maximum pressure. Cut the flow and it idles down for reduced noise, pump wear and engine wear.